Berlin, Germany, 2015-10-5 — /Travel PR News/ — Rail technology leader Bombardier Transportation announced today that the French National Railway Company (SNCF) has exercised an option for eight additional Regio 2N double deck electric multiple units. The order will be financed by the Midi Pyrénées region and is valued at approximately 56.5 million euro ($63.3 million US). This additional order is part of an option included in a contract signed in 2010 with SNCF to provide up to 860 trains for various French regions. The Midi Pyrénées Region ordered ten Regio 2N in December 2013, and this new order will increase the region’s fleet to 18. Delivery will take place between 2017 and 2019. Altogether, ten French regions have ordered a total of 209 Regio 2N. 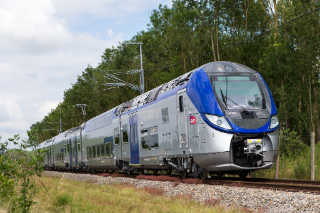 To date, Bombardier’s Crespin site in Northern France has delivered a total of 45 well-performing trains to six French regions. Since commissioning in October 2014, the Regio 2N fleet, based on the BOMBARDIER OMNEO double-deck EMU platform, has traveled over a million kilometers in service. Passengers riding in the Regio 2N will benefit from the train “tube”-style architecture. It features a large number of comfortable seats, indirect lighting, electrical sockets, air conditioning and a passenger information system. The Regio 2N is also known for its low operational costs and energy savings of about 20% per passenger. This is in part thanks toBOMBARDIER ECO4 technologies such as the BOMBARDIER MITRAC Permanent Magnet Motor which captures electrical energy used during braking. BOMBARDIER, ECO 4, OMNEO, MITRAC and The Evolution of Mobility are trademarks of Bombardier Inc. or its subsidiaries. This entry was posted in Business, Trains, Transportation, Travel, Travel Management, Travelers and tagged Bombardier Transportation, French National Railway Company, Regio 2N double deck, SNCF. Bookmark the permalink.